We Fear Silence presents Sunday Best. You are here: Home / events / We Fear Silence presents Sunday Best. We Fear Silence have built a reputation for putting on some of the best and most innovative parties in London over recent years, not afraid to mix things up they’ve presented parties as diverse as Border Community to Chew the Fat. They have partnered with some of the biggest names in electronic music, and are now working to bring some serious parties to London’s Cable. For the next instalment they welcome Bestival’s head honcho Rob da Bank, as he presents his own Sunday Best, the iconic and eclectic label that’s known for finding some of the best hidden gems in music. 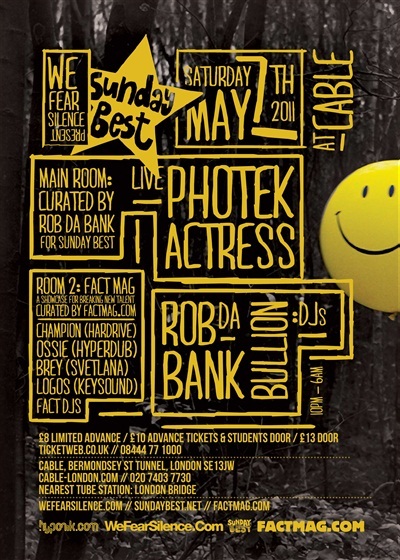 ‘Cable’s Main Room is headlined by an all-time dance music legend in the shape of Photek, touching down in London from his new base in LA to showcase his brand new live show. 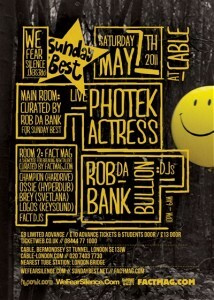 One of jungle and drum’n’bass’ pivotal producers who subsequently made an acclaimed house album, Photek aka Rupert Parkes is an innovator whose influence on the current wave of cutting-edge producers is palpable at every club across the country. Also headlining the Main Room is Actress aka Darren Cunningham, whose tracks blur dubstep, techno, electro with a fearlessly experimental mindset, resulting in masterstrokes like last year’s ‘Splazsh’ album, released on Honest Jons and hailed by everyone from Pitchfork to The Wire, and his debut long player, ‘Hazyville’, released on Werk Discs. Keeping Cable’s Main Room party in full swing, XL-signed Bullion and Sunday Best and Bestival ringmaster Rob da Bank will be bringing the platters that matter to the ones and twos. Sounds like yet another winning partnershop for the folk at We Fear Silence. Toolroom takes over Ministry for NYE.